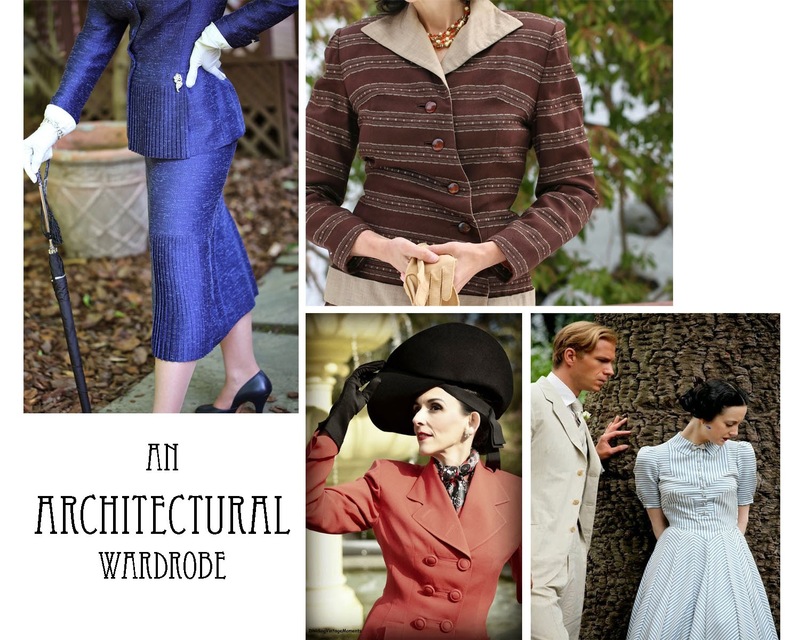 Is Your Wardrobe Architectural, Printy, Tactile, or Utilitarian? Architectural, Printy, Tactile, or Utilitarian. There is no category that is better or worse; it just seems that all of us lean toward one when it comes to our outfits. To explain, I've found some fellow bloggers whose outfit posts seem to point toward a certain style of wardrobe. They encapsulate the trends of a certain category and rock them with their own flair! An architectural wardrobe centers around the lines of garments, and people with these wardrobes tend to have tailored, crisp garments with intricate details. Print is often considered secondary to these lines and details, and their wardrobes may have more solid colors. They find themselves drawn to dramatic silhouettes, and oftentimes the clothing they choose is seen as timeless or avant-garde. Those of you who follow Joanna know that she has a definite love for tailored suits, especially Lilli Ann suits. 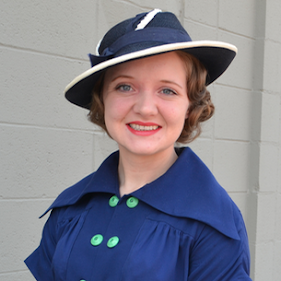 Her outfits are very tailored, include impeccable details, and often incorporate large, dramatic hats. While she definitely wears prints, she picks garments that still have interesting lines to them along with the print, like the striped jacket above, or that use the prints to create more architectural interest, like the striped inspiration dress she has shared. Definitely a classy dame! 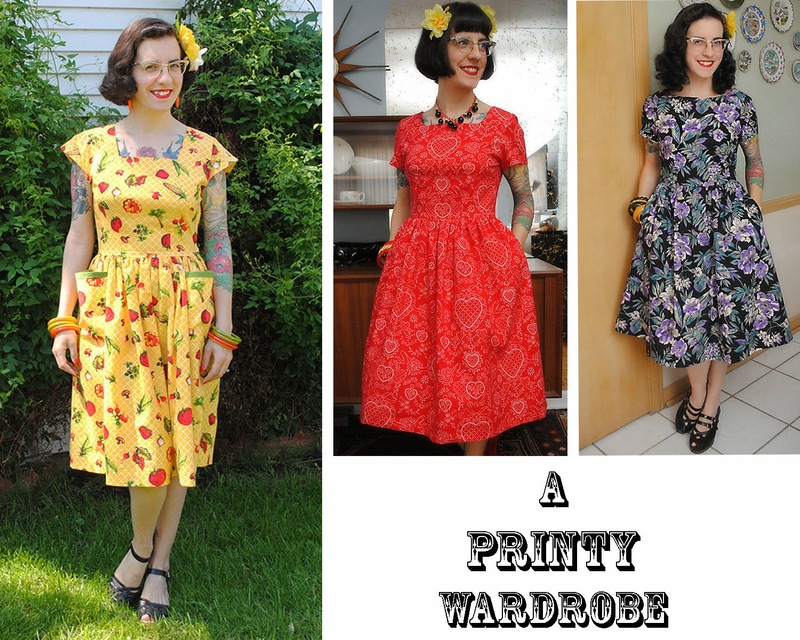 A "printy" wardrobe is one that is built on prints. Oftentimes a person with a printy wardrobe will find herself having to buy the obligatory solid colored pieces just so she has something to coordinate with all the print pieces she has. Print also takes precedence over much else for printy people, and oftentimes they may use the same pattern over and over with different prints. The printy wardrobe is oftentimes seen as kitschy and full of personality. Tasha is a great example of a printy wardrobe wearer. She oftentimes finds a pattern she loves and that fits her well and will slightly tweak it while recreating it in new and bold patterns, such as the Emery dress versions above. She often says she can't resist a fantastic pattern! A tactile wardrobe is focused on textures and fabrics. Tactile closets are full of differing materials and diverse "feels" of clothing. People who wear them often combine lots of seemingly unrelated pieces into a texture-rich ensemble that somehow just "goes." This also goes for accessories where they may mix metals, colors, and media. They are the kind of people that walk through a store feeling all the clothing. They may also use "feel" in a lot of the descriptions of their outfits, such as loving how a dress feels when it blows in the wind. This fabulous lady has some of the most diverse, texture-rich outfits I've ever seen! She's constantly pairing things that seem so random into fabulously interesting outfits. Her looks often include a mix of leather, flowy fabric, and metal jewelry that all contrast with each other and make impeccably interesting ensembles! I'd like to start this one with the disclaimer that I in no way want "utilitarian" to be connected to the idea that practical people sacrifice style for pragmatism. No way! It just happens to be that people with utilitarian wardrobes dress for comfort in their daily activities while maintaining a stylish look. These people often gravitate toward looser, soft garments that are cared for easily or less work to sew up. They may wear similar garment shapes because it's what they're comfortable in, either for a personal preference or because of a daily activity that requires a certain wardrobe. "I'm not the kind of girl who can sacrifice my comfort to try and look like a disheveled version of Miss Fisher or Katherin Hepburn..." Rochelle said in one of her recent posts. 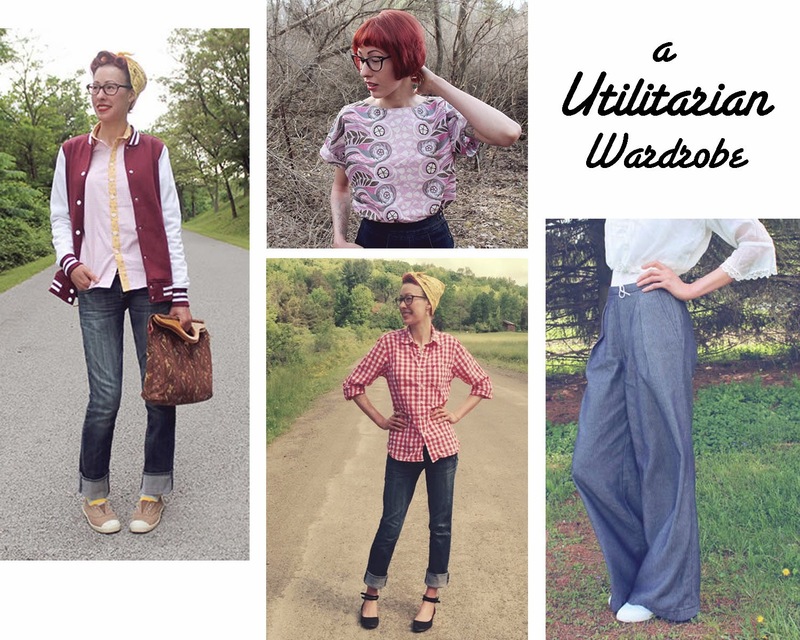 It pretty much sums up the idea of a utilitarian wardrobe, and I think we can all agree that she rocks her comfy, personalized button-downs and bandanas with great pizazz, all while remaining true to what she actually wants to wear. Personally, I feel like mine is a mix of architectural and printy. While I would definitely love to have more architectural pieces (suits! ), I don't actually have many in my wardrobe right now at all, so it's currently more "printy" than anything else. So what about you? Do you feel that your wardrobe leans toward architectural, printy, tactile, or utilitarian? Or is it even a mix? I think my wardrobe is probably a mix of printy and utilitarian. Some times, I adore great prints but I also love great basic pieces that can mix and match for that perfect comfortable wardrobe. Plus, I feel like some prints can make me look too young so I have to be careful about that. I'm taking great strides towards a more functional wardrobe that I actually want to wear every day! I'm trying to make more mix and match separates and find patterns that are comfortable and don't need any fancy shapewear. Oh good! I'm glad I captured your style accurately and that you enjoyed the post! This is such a fabulous and unique post! And I am utterly flattered by how you described me! And what is so funny is that I TOTALLY feel clothing when I shop! I refuse to buy something, even if I dig it's cut or print if the fabric feels weird! It's another reason I have difficulty shopping on-line. Ha, you actually DO feel clothing?! That's hilarious! Apparently I'm spot on! I care so much about my fibers these days that I will walk through the store feeling, and ONLY even look at the size, the color, the shape, even what garment it is! unless it's real. Real wool, real cashmere, real linen, whatever. But life is too short for crappy synthetics! This also allows me to not fall in love with garments that I will eventually be disappointed with due to their fibers. :-P And it helps protect my budget! Hey, it's okay! I read new comments on old posts, too! I've started to do that too, and I'm getting pickier! You're right though; it's more budget-friendly to buy durable pieces I'll love. Good call! Aww, thank you very much! I appreciate the share too! Great post! I would have said my wardrobe was printy, however upon closer inspection I think it's more on the tactile side of things.. I am definitely one of those people who walks about clothing stores (well, any store really) touching everything! Great post! I think I'm combination of printy and utilitarian in what I like to wear. As many of my sewing projects tend to be for special events I like to go for fun colors and fabrics. But having finished a pair of pants and another blouse, I'm loving the idea of making more comfy yet stylish items to wear on an everyday basics and not just for dressing up. Ha, yeah, that does make sense why half are from Rochelle and the other from Tasha! And wow, yes, four young children definitely requires a utilitarian wardrobe! Kudos to you for all your hard work as a mom! This is so very sweet of you to think of my style and I very much appreciate your analysis and thought into this. It is so true that I love architectural styles...I love line and form. I see clothing as art. I really enjoy looking at vintage fashion magazines and analyzing the styles and trying to understand the designer's views. I recently just got some Harper's Bazaar magazines from 1937. It's crazy how structured and beautiful everything was and a tilt hat is icing on the cake. I also like the different angular shots they took in the 1930s. Anyways, I could go on and on...love this post and thank you! Aw, I'm glad you like it! You're very welcome! These four categories work really well and you have chosen four great wardrobes to illustrate them with. I think I am a mixture of prints and tactile. I love a good print and definitely chose items based on that. However I do feel clothing when I am looking in shops and can never resist velvet or gorgeous knitwear for example. Ooo, I can't resist velvet or knitwear, either! Seriously, LOVE them. I read this post last week, but the reason I finally got around to commenting is because I just can't stop thinking about this concept! 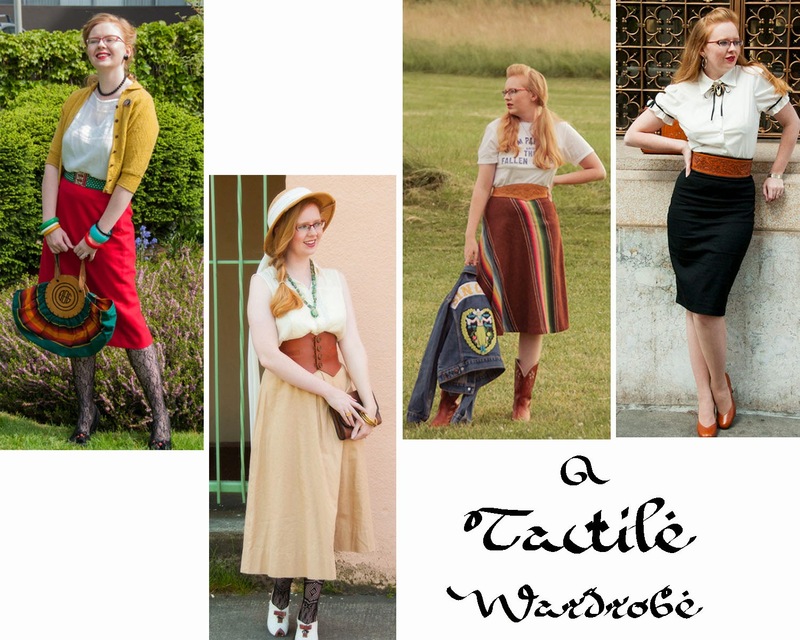 I definitely am squarely in the "print" category for summer wear, but I'm finding it interesting how many "tactile" blogs I follow! I've been having a blast jumping off from this point and analyzing how my style changes through the seasons and what I admire in other people's styles. :-) Thanks for this post- it's been a source of entertainment for me! Lily, I'm so glad! 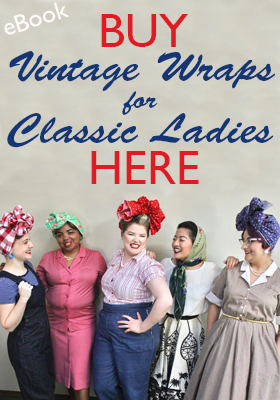 I'm glad you've enjoyed this post so much, and thanks for the kind words about my blog! I hope I'll be hearing from you again! This is such a great post! My style has been evolving over the past year, going from printy to utilitarian. 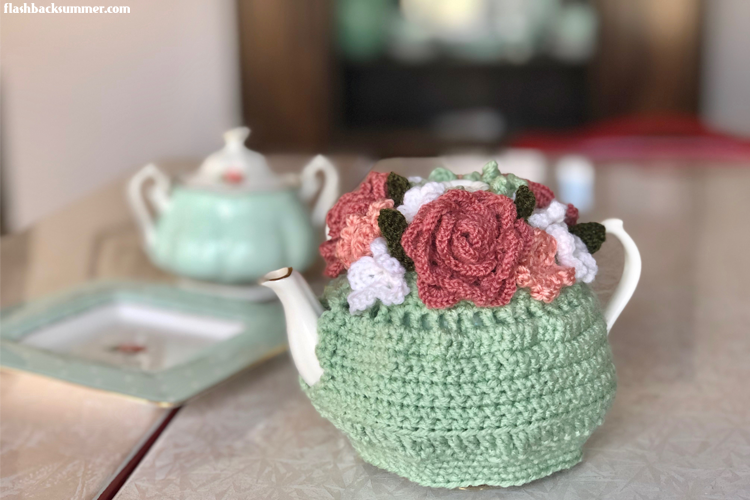 I definitely have a uniform and am known for making many versions of the same pattern with little tweaks for a slightly different look. I love how you've categorized wardrobes! Fabulous!